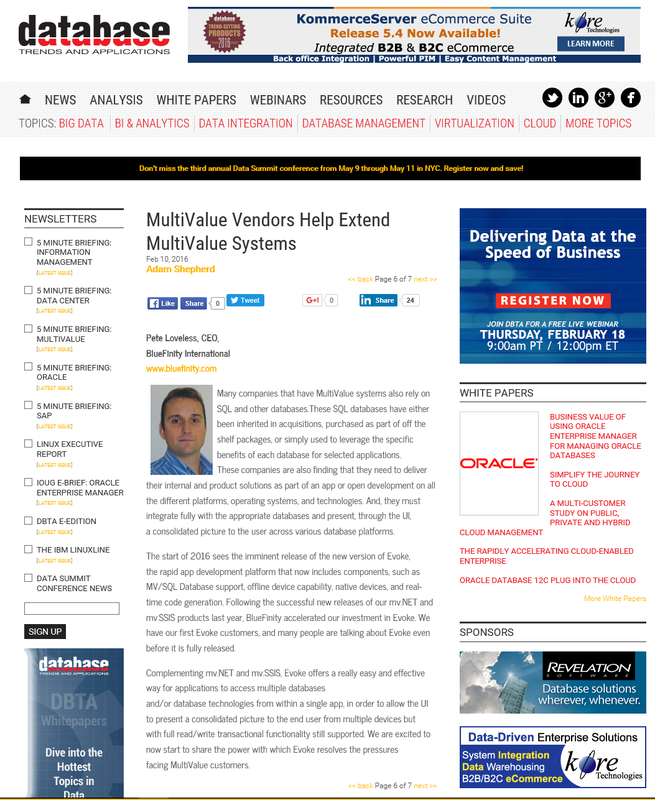 February, 2016 - Adam Shephard from DBTA reviews, in an interniew with Pete Loveless of BlueFinity, how BlueFinity products and evoke in particular are helping to extend the multivalue systems. Many companies that have MultiValue systems also rely on SQL and other databases.These SQL databases have either been inherited in acquisitions, purchased as part of off the shelf packages, or simply used to leverage the specific benefits of each database for selected applications. These companies are also finding that they need to deliver their internal and product solutions as part of an app or open development on all the different platforms, operating systems, and technologies. And, they must integrate fully with the appropriate databases and present, through the UI, a consolidated picture to the user across various database platforms. The start of 2016 sees the imminent release of the new version of Evoke, the rapid app development platform that now includes components, such as MV/SQL Database support, offline device capability, native devices, and real-time code generation. Following the successful new releases of our mv.NET and mv.SSIS products last year, BlueFinity accelerated our investment in Evoke. We have our first Evoke customers, and many people are talking about Evoke even before it is fully released! Complementing mv.NET and mv.SSIS, Evoke offers a really easy and effective way for applications to access multiple databases and/or database technologies from within a single app, in order to allow the UI to present a consolidated picture to the end user from multiple devices but with full read/write transactional functionality still supported. We are excited to now start to share the power with which Evoke resolves the pressures facing MultiValue customers. To see a copy of the article as an image please click here. To see a copy of the article online please visit DBTA. For more information regarding BlueFinity products and to download them visit bluefinity.com.